From my very first taste of confit de canard, I was hooked. Not deep in the heart of Southwest France, but next to the Smithfield meat market in London circa 1998. At Club Gascon, hearty takes a haute turn with signature regional dishes and ingredients from Gascony like cassoulet, garbure, foie gras, truffles and of course, duck confit, being transformed by chef-proprietor Pascal Aussignac into the most exquisite of small plates. I can vividly remember the yieldingly succulent flesh sheathed in an impossibly crisp skin - the hallmark of truly great confit - the flavour permeated with the gentle breath of delicate spicing, the tastiness of salt without the saltiness. 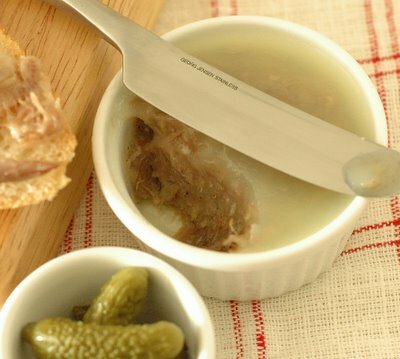 Confit, which means "preserved", is one of the great farmhouse traditions in the French Southwest, where preserving meat to last through the cold months was essential to survival. While virtually any meat can be confited (and in modern cookbook and menu speak, the term is loosely used to describe any meat, fowl, fish or vegetable that has been poached in fat till meltingly tender), duck and goose are likely the reason for confit's being - come the time to harvest foie gras, farmers would have had more meat on their hands than they could sell or consume. The prudent cook who wastes not, wants not - duck and geese produce prodigious quantities of fat, so the surplus meat is cured in salt to rid moisture, then cooked and put up in its own fat (the cooled solidified fat acting as an airtight seal) in earthernware crocks and left to ripen in cool cellars, thus providing the family with ready reserves of meat which could be dipped into throughout the year. Duck, thus preserved, undergoes a change in character. Like all the greatest charcuterie, the meat acquires a whole new taste and texture, becomes a paean to the joys of salt and animal fat. Despite the advent of refrigeration, this tradition, this frugality born of necessity, still thrives, for the simple reason that it tastes so enormously good. The theme for the 23rd edition of Is My Blog Burning? is Vive la France Régionale avec un Verre du Vin!, "a regional French dish with a glass of wine", hosted by the wonderful Cucina Testa Rossa, the deadline for which I have completely missed. Nonetheless, this magical theme sparked off an irresistible urge to make confit, given added impetus by the recent local availability of duck legs imported from Southwest France. I've tried many confit recipes over the years, in the hope of some day coming close to the taste of that unforgettable first encounter. These usually specify heating atop the stove over the tiniest flame possible or in the oven at a low temperature, and more unusually, in an electric slow-cooker with the setting on low and the lid askew (a brilliant method, by the way). I've come to the conclusion that all 3 routes work so long as you pay heed to a few fundamentals. Recipes which ignore or gloss over the fundamentals are at best infuriating, or more likely, doomed to failure. Avoidance of becoming a sitting duck, a victim of obfuscation, comes at the inedible price of having cooked your fair share of stringy ducks, which I most certainly have. The duds can be ducked by scrutinising a confit recipe for its likely potential. Basic considerations include the species of duck, cut of duck, type of cure, length of cure, type of fat, temperature at which the duck and fat are cooked, length of cooking, manner in which the duck is cooled, length of ripening time, and method of reheating/crisping. While not food to rustle up in a hurry, the actual making of confit is not difficult; please don't let my verbose instructions (with attached explanations in tow) fool you into thinking otherwise. I've attempted to write the recipe with as much detail as matters, a think-aloud process that hopefully goes towards clarifying the fundamentals as I understand them currently. Apart from satisfying my pedantic streak (and a rather large one it is too), it's a distillation of lessons learnt thus far, paid for in dismal duck dinners flung down the chute. For a full treatment of the subject, I find Paula Wolfert's The Cooking of Southwest France indispensable. She gives instructions for all 3 heating methods mentioned above. The earlier edition goes into a little more minutia than the latest, but the instructions are by and large the same. (Speaking of which, for those of you who own one of these babies, the 2005 edition boasts a new fourth method that will be of interest - a "confit" en sous vide in which the duck legs are sealed in pouches using a vacuum packer then simmered very gently in a 180°F water bath for many hours.) The recipe below culls trucs gleaned from this gem of a book, and then some, primarily from Thomas Keller's Bouchon and Michael Ruhlman's Charcuterie. Rinse the duck legs under cold running water and pat dry thoroughly with paper towels. Most recipes advise trimming the excess fat and skin; I don't because I like "re-forming" the legs into a plump compact shape with the overhang of skin. Do so if you wish, in which case weigh the legs after trimming and adjust the quantity of salt used in the green salt blend according to the formula in note 4. For the green salt, place the salt in a coffee or spice mill or small food processor. Add the bay leaves, thyme, parsley, and peppercorns. If all the herbs do not fit, start grinding the mixture using only part of the parsley leaves, adding more as the leaves break down. Pulverise till finely ground and vividly green. Massage the green salt over the legs, rubbing in a little extra on the thicker, fleshier parts and around the joints, and not missing the surfaces nestling underneath folds and flaps on the craggy flesh side. Strew the finely chopped garlic evenly over each leg. Place the legs flesh side up in a ceramic dish that will hold them comfortably in one layer, gently unfurling the exposed thigh flesh out flat so it cures evenly. Cover with plastic wrap and refrigerate. After 12 hours, turn the legs over so they sit skin side up, cover the dish, and refrigerate for another 12 hours. Do not exceed the total curing time of 24 hours or the confit will be overly salty. Place an oven thermometer in the center of the oven and preheat the oven to 180°F (82°C). Throughout the cooking time, it is important to check the heat periodically to be certain that the oven is maintaining the correct temperature. Given the vagaries of the average domestic kitchen oven, the oven thermometer helps ensure that all is on track - 180°F is ideal, although no harm comes to the confit if the lowest setting on your oven is 200°F(93°C), or if you need to adjust the heat level from time to time given erratic oven behaviour and a range of temperatures is more realistic. Do not let the temperature exceed 200°F or there'll be the dreaded stringiness to contend with. The duck legs are done when the meat is very tender. However, if cooked for too long, they may fall apart later when they are being crisped; so start checking after the 9 hour mark by gingerly lifting a leg from the fat and prodding it gently (without piercing the delicate skin), returning the leg to the pot and the pot to the oven if necessary and checking every 30 minutes thereafter until the meat is perfectly cooked. There are also visual cues to watch out for. The fat will be clear, not cloudy, which indicates that the duck is no longer releasing juices, that the juices which have been released are cooked and have settled on the bottom of the pot. The duck, which will have also settled to the bottom of the pot, will be showing a lot of bone as the meat rides up the bone like a mini skirt on a comely thigh. Once you've ascertained that the duck is perfectly cooked, remove the pot from the oven, uncover it, and allow the duck to cool in the fat to room temperature. Do not hurry this process. It is important to cool the meat in the fat as slowly as it was heated. The gentle initial heating kickstarts the process of melting fat out from under the skin, the gentle cooking ensures a tender texture without stringiness, and the gentle cooling prevents the meat from falling apart or losing its shape. Once cooled, store the confit by transferring the legs to a storage container and pouring the rewarmed fat over the legs to submerge them, leaving behind the meat juices. (Any fat that does not fit into the container can be stored in the freezer for at least 6 months, for use in other projects.) Cover and store in the fridge for no longer than 2 weeks. To preserve the legs for months rather than weeks, as was confit's original intended purpose, you must take scrupulous hygiene precautions; the above simple method of storage is insufficient. The confit is now ready for use in any number of recipes, although a ripening period of as short as a week results in further texture and flavour improvement. Bear in mind, however, that the robust flavour of true confit needs at least 3 weeks to begin developing its characteristics. Confit seldom lasts longer than 2 weeks in our home, and not only because we are greedy. Given the scarce storage space in our tiny fridge, and limited by the size of my largest cocotte, I don't use more than 8 legs in one batch of confit (incidentally, doubling the above recipe is easy; the method, temperatures and timings stay exactly the same, and the quantities are simply doubled, with the exception of the duck fat and lard - proportionally less fat will be necessary to cook increased quantities of duck). For long term preservation, please refer to the instructions laid out in Paula Wolfert's book or Michael Ruhlman's book for sterilizing your equipment, removing all traces of meat juices from the fat, and sealing the confit crock. Remove the pot or container from the fridge and allow it to sit at room temperature for a few hours in order to soften the fat sufficiently to remove the desired quantity of legs - which are very fragile - without tearing, breaking or otherwise bruising the skin and flesh. To serve them crisped, see below. 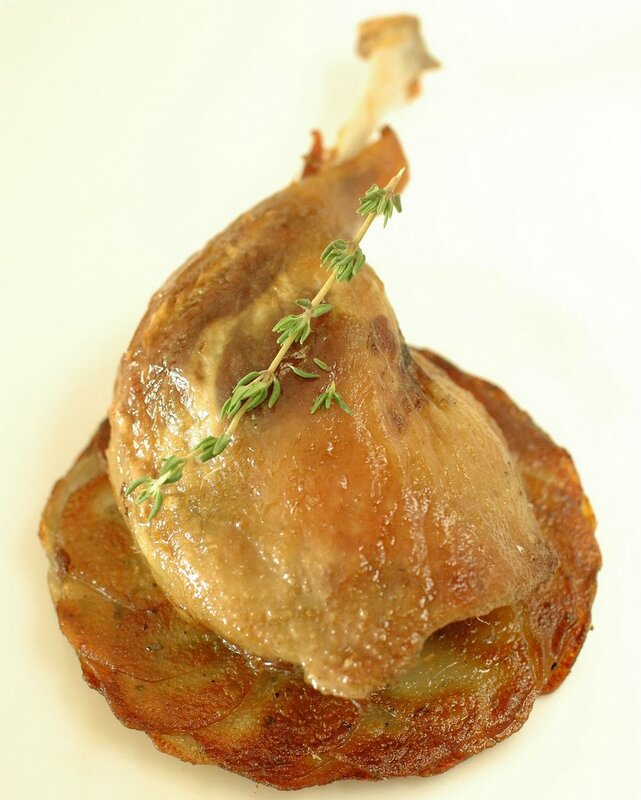 1Pekin/Long Island and Muscovy duck legs can also be used for confit. However, you will have to adjust the cooking time as they differ in size, fat content, and flesh quality. Moulard, with its unique flavour and dense, fleshy, fatty legs, is the duck of choice for confit in Southwest France. 2While duck breasts can be used, they do not take as well as legs to the confit process. The most efficient way of shopping is to purchase duck leg joints. 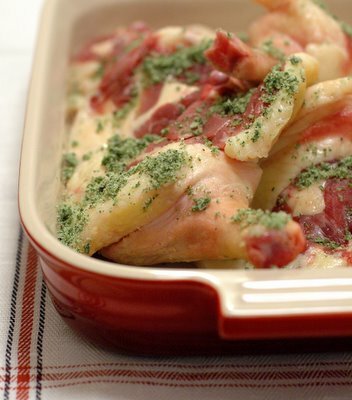 However, if jointing whole ducks yourself, set aside the breasts for another purpose/dish. 3The green salt technique comes from Bouchon. In most recipes, duck legs are rubbed with a dry marinade of salt, chopped herbs and whole aromatics. With green salt, everything is first pulverized together to a sandy green paste, which ensures the most even distribution of seasonings possible. 4Note that volume for volume, all salts weigh differently. The traditional formula to adhere to is 22 grams of salt for each 450 grams of meat. I use Maldon because I like the sweetness it imparts. With Maldon, for the total weight of meat I’ve specified (1200 grams), it works out to 58 grams, which is 4 Tbsp. If using a different salt and/or different quantity of meat, please weigh everything and do the necessary math for the right amount of salt. 5It is tempting to chuck the garlic cloves into the processor along with the green salt ingredients. Please resist the temptation. The flavour and aroma of smashed garlic has a pungency that is entirely different from that of chopped garlic. As you are after the suggestion of garlic, smashed garlic has no place here as it would become too dominant. 6The quantity of fat needed to entirely submerge the duck legs will vary according to the shape and size of your cooking vessel and the shape and size of your duck legs. Ideally, the vessel should fit the duck legs snugly in one layer. The quantity of fat I’ve specified will generously submerge 4 large duck legs, and you may possibly not need all of it. However, seeing as excess duck fat and lard freeze well, and you do not want to be in the hairy situation of not having enough fat to cover the duck mid-way through the recipe, there really is no harm done having extra. 7You can use 6 cups of rendered duck fat (or goose fat, for that matter), or combine 3 cups of duck fat with 3 cups of lard. I prefer using a combination because I like the flavour of pork fat, finding that it enhances the final products, making for a tastier duck confit as well as a tastier fat for future use. You can purchase duck fat and goose fat in tins, but it’s not only easy to render your own, it may be a necessity if the tins are not readily available. As for the lard, do not use packaged commercial lard which is too assertive (plus you can’t use the fat for future cooking). Either purchase good quality butcher’s lard from a reliable source if you have access to it, or render your own. To render each type of fat, the procedure is exactly the same. For 1 cup of rendered fat, you need 1 pound of fatty duck skin and trimmings of duck fat, or pork fat. Dice the fat and combine it with ¼ cup water in a heavy-bottomed saucepan. Set it over a very low heat, uncovered, for several hours to render. The fat will liquefy and the water will evaporate, leaving behind pure fat. Do not let the fat come to a boil or turn brown. Strain the fat through a cheesecloth lined sieve before using or storing. Confit can be used in countless ways. Chunks of it are always buried in the best cassoulets and garbures. Crisped and shredded, it's excellent in a salad of bitter leaves, stirred through risotto, added to a pasta sauce, or used as a filling for ravioli, just to name a handful of good things. But perhaps the very best of all, is also the very simplest of all. A whole leg of duck confit, crisped and served atop a bed of potatoes cooked in the unbelievably delicious fat from the confit crock, is as soul satisfying to eat as it is to prepare, allowing you to best appreciate the true savour of confit. There is a seductive logic and integrity to making the best use of the preserved duck as well as the fat in which the duck was first poached then preserved, the lushness of the latter being shown off to greatest effect by the humble potato. When I served the confit for dinner on Sunday, it was in this salt of the earth manner - crisped confit de canard with pommes de terre à la Sarladaise, the Sarlat dish of thinly sliced potatoes cooked in confit fat that boasts the soft centered-crisp edged textural contrast beloved of this genre of French potato recipes. Many methods exist for crisping confit. Some involve steaming, then finishing in a pan. Some involve baking alone in the oven till crisp. The method I like most so far is from Bouchon. Preheat the oven to 375°F. Heat a nonstick skillet that will hold the duck legs in a single layer over medium high heat. Reduce the heat to medium and carefully add the duck legs skin side down. Sear for 5 to 6 minutes, or until the skin is a rich golden brown. Remove the skillet from the heat, tilt it, and use a spoon to transfer enough fat to coat the bottom of a baking dish large enough to hold the legs in a single layer. Place the duck legs skin side up in the dish. Transfer to the oven and cook for 8 minutes. Chubby Hubby and S, otherwise known as The Fabulous Mrs Chubby Hubby, had generously brought over a bottle of Reserve de la Comtesse 2000, Pauillac, the second wine of Chateau Pichon Longueville-Lalande, to go with dinner - as you would expect from two gastronomes with the mostest, the match was outstanding. On a completely separate, incidental but related note, absolutely nothing goes to waste when you make confit, as becomes a food created out of economy. It is the proverbial gift that keeps on giving, rewarding the cook richly for months after the confit itself has been eaten. The confit fat, if you haven't already gathered, is liquid gold in the kitchen, an amazing medium in which to sauté root vegetables, or use as a flavouring to enrich a plethora of braises, sauces and soups, or to put up yet more batches of confit (a process you can go on repeating for as long as you've properly maintained the fat; eventually, it will get too salty). But that's not all. Even the head of garlic cooked with the confit has an afterlife, albeit a short-lived one. Push the soft, caramel-hued garlic cloves through a sieve to obtain a tiny quantity of smooth creamy pulp, adding a little confit fat to adjust the consistency. Smeared on crisp little croutons and sprinkled with fleur de sel, you now have yourself a ridiculously good morsel for floating atop soup. As the duck cooks slowly in fat, it releases flavour-packed juices and collagen which sink to the bottom of the cooking vessel. Protected by a mantle of fat, these become an intense concentrate, a deeply flavoured, gelatin-rich essence. Extract this precious fluid after you've cooled the confit in its cooking fat, by lifting out the pieces of duck and putting them in a container, then ladling only the fat off to cover the duck in the container, thus leaving behind the meat juices. Heat and serve as is with crisped confit, use to fortify sauces and soups, add to a vinaigrette for dressing a salad topped with shreds of confit, and loveliest of all, to make an extremely simplified but nonetheless scrumptious rillettes, which have the additional bonus of using up the debris on the bottom of the cooking vessel after the fat and juices have been removed. Take a few scraps of confit meat, coarsely shred with two forks, stir in the meat juice and debris, moisten with confit fat as necessary, season liberally with freshly ground black pepper, judiciously with quatre épices, and sparingly (if at all) with salt and you're good to go. Packed into little ramekins and sealed with more confit fat, this really is food for nothing yet forms the basis of the most glorious of simple lunches - all you need is some crusty baguette, cornichons, and a glass of something white and well-chilled. And you say I am brave for attempting Ispahan - what impressive results you have achieved! I have no feel for the savory side of cooking so I applaud you for being so skilled in all aspects of the kitchen! Another astounding accomplishment in your already stellar culinary career!! Beautiful. I would not have thought ot attempting to mae confit, mainly because getting those meats here in the US require special orders, but what the heck! It looks just like the one while still in France! J, I'm so glad I found your blog: I love the recipes, the pictures and your writing. I've always wondered what those big cans of preserved duck at my nearby store are - and now I'm super excited as I found your crisping instructions. I luuurv duck :) I'm definitely linking to you! great write up..........miss eating a good duck dish. That history was fascinating, J., and though I'm not set on making confit myself in the near future, I think that your detailed account will become an indispensible resource to many who wish to try. As usual, amazing prose and what detail! Once the boys go off to Switzerland, I'm going to give it a shot. Well, that's the intention anyway. Love your pics...as always. that looks so amazing. I think you're amazing!! your passion in food and prose, and sharing all that is just top class. Keep it up J! duck remains my indulgent item; mostly enjoyed when someone else cooks it as ive been a little worried that id over cook it. you have worked wonders with your ingredients here... and everthing looks absolutely tempting. Will you adopt me please? Seriously. How did you know I have been pondering confit recently? I've always been terribly intimidated by confit but I could feel the winds of inevitability pushing me to a disastrous experiment of it in the near future. Thanks for such a detailed write-up (I like your verbosity by the way)! Perhaps armed with this, I will now have the guts to try this out. I think the fabulousness must be in the genes, J! Great post and I loved reading every bit of it. You just blow everyone else out of the water with the dishes you make. You're my hero, J! I have always thought of duck confit as one of those recipes to make "someday". You've made it seem both do-able and immensely rewarding. Your writeup is wonderful, down to what to do with all those delicious by-products. It's enough to make me want to run out right now and buy a duck leg - or eight! hi j, hey... as usual, i didn't read this post fully as got distracted by the beautiful photos haha! anyway, i hv tagged you for a meme - hope you don't mind and hope to see your answers soon! details r on my blog - cheers! J I faced my fear of cooking ducks just 2 years ago. and there he was presented me confit d canard. Hi J, i have left you a message on your previous post but i can't find it so i will try once more... huhu. First, let me just say that it's always a pleasure and a great read your site is. Second, your photographs speaks to me most of the time they say, 'eat me'. This site is soooo addictive! Third, re your question on my 'kaldereta', sorry you can't get hold of mama sita's. Subs you can use is a simple 1/2 can sieve tomatoes (of course it depends on how much you're cooking) added to this is roughly 1 tbsp of tomato paste (pureed). You might say is this it? Mama Sita's a combination of concentrated tomatoes + the addition of garlic, onion, salt, etc which you'll notice is already listed on my recipe anyhow. Hope this helps. Your photos are simply exquisite. Btw, you have such patience for long cooking procedures that most of the time i would avoid to enter into. I admire you for that! The lack of time in my hands to prepare such laborious meals sadly does not permit me so... how i wish i was a lady of leisure... indeed how i wish. Oh, those gherkins... i could just take a bite! J, what a wonderful post, your words bring the process and history to life. I think I can actually smell it cooking. And naturally, your photos are awesome. I always love dropping by. Beautiful confit, beautiful post, Joycelyn. I've always wanted to try making it myself, but you see I'm not very patient like you... I can almost taste it from your gorgeous pictures, thank you for sharing. very very cool. the duck looks perfect, and the potatoes look gorgeous as well! i want some of the garlic toast yum. Wow! Just in the nick of time! I've been wondering what the heck confit means and here you are - swooping in to explain it to me and catering to my desire never to waste anything that can be used again! Bravo! This all, every bit of it, sounds incredible, and was so informative. hey there thumbs up for providing so much info on confit, but i have a question that is are confit and those chinese waxed ducks of the same nature? Your confit looks absolutely to die-for! I made one a few months ago and while it didn't look nearly as pretty as yours, it sure made for good eating. And the fat afterwards, crikey! I'm in town by the way, and I brought amongst other goodies, my enormous jar of goose fat. Was thinking of a goose rillettes next if I can find a safe bird to eat ;-). Once again, you have put up a good-looking, well-written and informative post. Cheers! Hi J., how are you? i am FOR SURE knocking on your door if i do come out to Singapore. I love anything duck. Beautiful posting as usual. Hope all is well. hi antti, thanks! so glad you visited; really enjoyed visiting your lovely blog too! hi nic, thanks - i think this post was more a note-to-self than anything else so i don't repeat any of my previous mistakes! hi a, am totally looking forward to reading all about it! hi saffron, i know what you mean - it is very easy to over cook a duck when roasting or frying. which is why i love making confit - there's little chance of that happening! hi melissa, thanks, you are much too kind. i think you would totally enjoy the process of making confit - the by-products, like you say, are a total bonus! hi foodfreak, time consuming, it is; but i suppose it's made up for by the fact that it's a fair number of meals right there waiting in the crock! hi ruth, thanks so much for your kind words; am always happy to see you! hi pille, thanks; funnily enough, the raw picture is my favourite of the bunch too! hi viv, thanks! 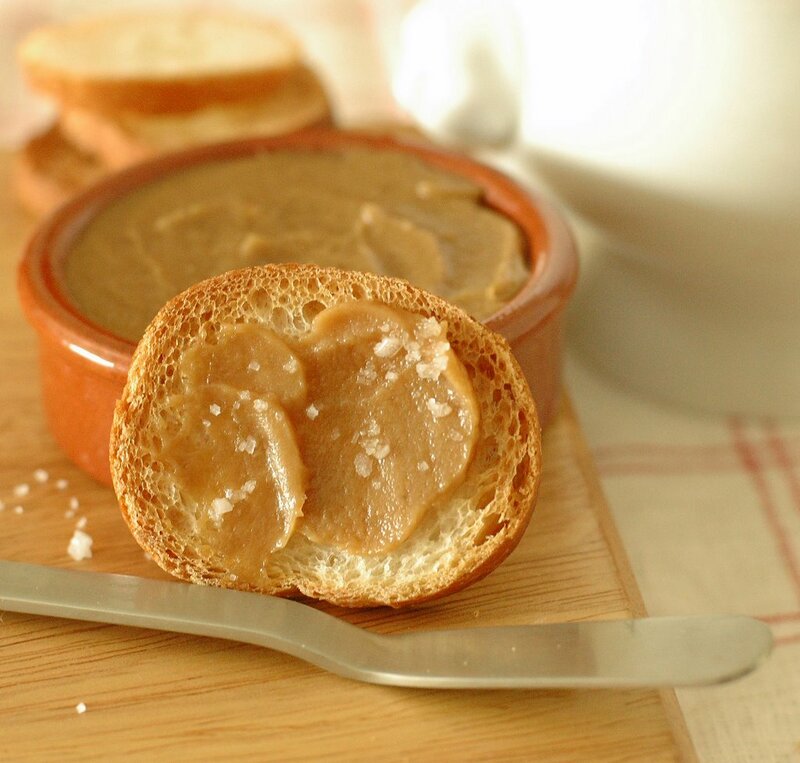 hmm, goose rillettes - the very thought is making me swoon! hi dylan, good to see you ;) please come knocking anytime! If you love Paula Wolfert you will love this cassoule and her cassoulet recipe. I'm impressed you made the confit yourself. I usually grab a tin.